I love Christmas more than any other time of year, and I am that really annoying person that starts counting down the days from September…or earlier! I love the build up, the planning, the baking, the decorating, the shopping, the telly specials, the lights….there’s not much about Christmas that I don’t love….except wrapping the presents… I HATE wrapping, I’m very bad at wrapping. Mr H on the other hand is exceptionally good at wrapping, his presents for me arrive under the tree looking like they have come from a film set, mine for him arrive looking like the bad elf had a tantrum and ran loose with a roll of paper and three rolls of sellotape. Sorry Mr H! Decorating our home is always a big deal for us, I have a countdown just to decorating day and this year was no different, and we had a new home to decorate, after moving in October. There’s lights and tinsel galore! But there’s also rules! 1. First there’s the food that you need to accompany Christmas decorating night. A very important factor to any evening. A big platter of ‘picks’. 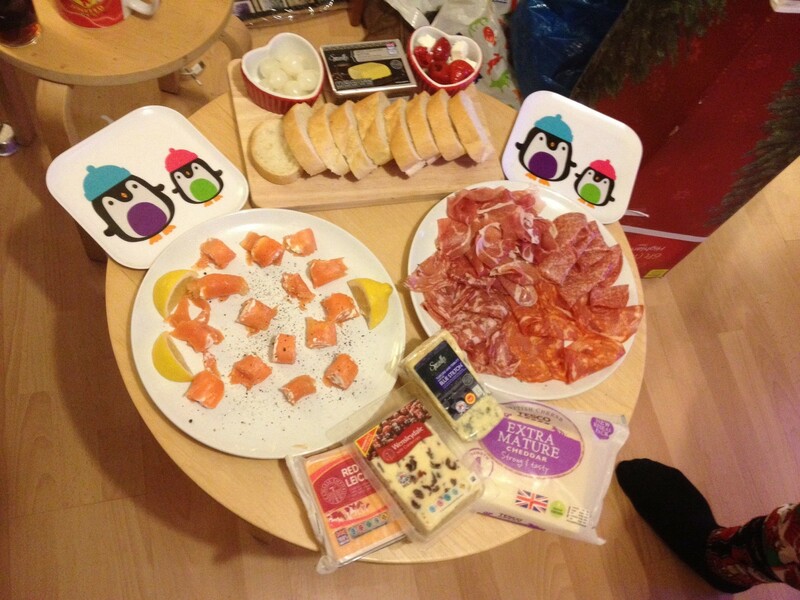 Cheese, cold meats, crackers, salmon and cream cheese, pickles, whatever you fancy, its a bit of an echo of post Christmas day meals, but it means that you can eat as you decorate and pick at it throughout the evening. 2. Secondly, you must be accompanied by the cheesiest sing along Christmas music that you can find, usually the music channels are good for this as you get a good mix. Sing loudly, and dance as you decorate. And usually a decent Christmassy themed outfit is required, this year it was a candy cane striped jumper. 3. Then the final rule is cram as many lights into the room as you can. 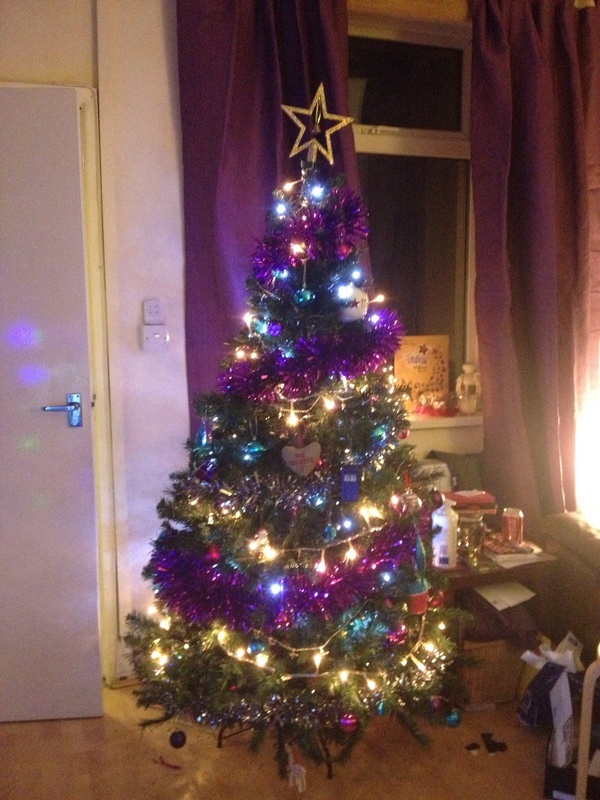 Of course you can’t all be blessed with lighting designer husbands, but at Christmas its pretty easy to do. I LOVE fairy lights….and as you can see even the telly has been anointed with the Christmas lights. 4. 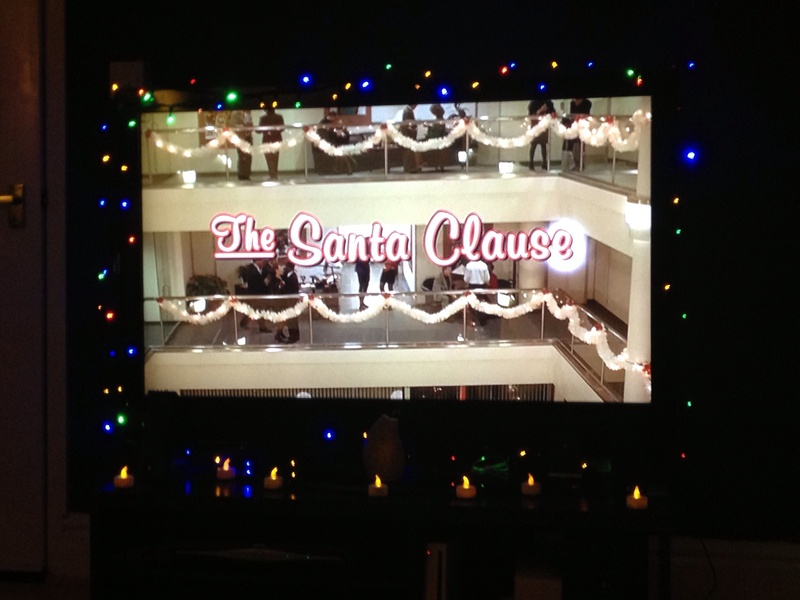 You have the ‘Big Switch On’ and snuggle down on the sofa watching disney’s The Santa Clause. This is the only film to be watched straight after decorating (although if you’ve got time you can watch as many as you can afterwards! ), drinking your favourite holiday tipple (usually a cherry brandy and coke for me, but this year it was just coke! ), and finishing off the food platter. Or starting that tin of chocs if you’ve finished your platter!